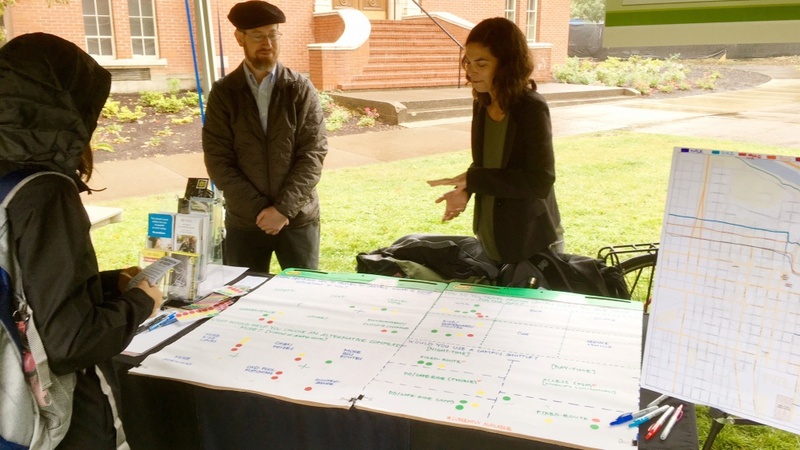 Regardless of how people commute to campus — by car, bike, bus or foot — the UO Department of Parking and Transportation invites comments while undergoing its first strategic planning process under the leadership of new director, David Reesor. The plan began in late September and upon completion will help set a mission and overall vision for the department and identify areas of improvement. The information compiled during the process will shape an overarching five-year plan to enhance parking and transportation services and make campus easier and safer to navigate. As part of their outreach, department officials spoke with students, faculty members and staff at the department’s Transportation Day booth. Participants shared their preferences on traveling to and around campus, mapped current commute routes and identified transportation mode choice. The department is also conducting focus groups with partner agencies, various campus user groups and other campus departments. The parking and transportation strategic plan will be completed by late spring or early summer 2019. For up-to-date information on progress or to sign up for email updates, visit parking.uoregon.edu/content/planning-projects. Contact Reesor at dreesor@uoregon.edu or 541-346-5796 with specific questions.